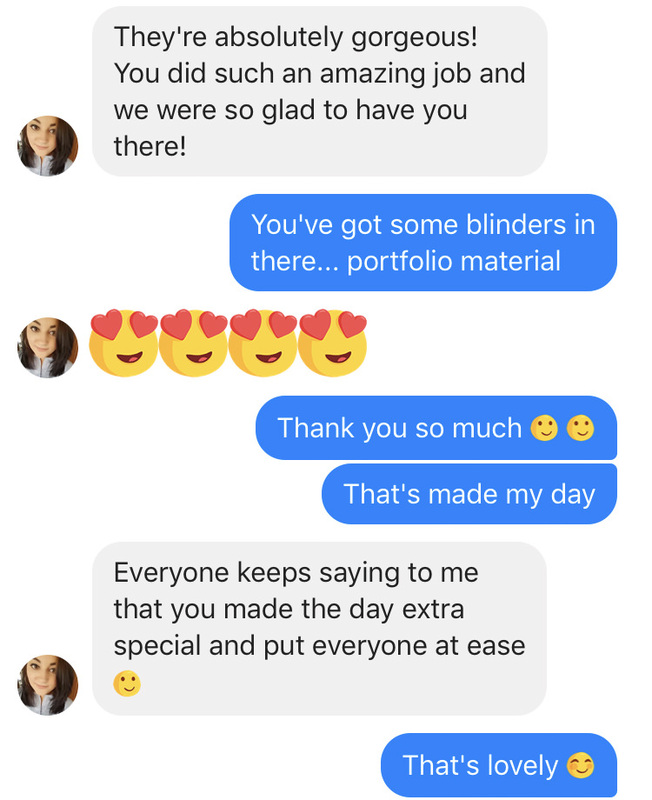 Kind words from some of my lovely previous clients – see what others have to say about me. Don’t hesitate to get in touch for an informal chat if you’re looking for the best portrait or wedding photographer Folkestone, Kent or the surrounding areas have to offer – contact me today. On behalf of me and my husband, I can’t say enough how great Tim was on our wedding day, all the guests loved him and nothing was too much for Tim in making our day special. Amazing photographs and service from start to finish! I would highly highly recommend. Even the after service with help in making something special for my family has been amazing-again nothing too much for Tim! I think people are missing out on a top rated photographer who goes that extra mile and makes you feel comfortable throughout the whole process! You will NOT find another photographer like this for such a reasonable price (too low in my opinion)!💙👰🎩 thank you Tim Hensel! 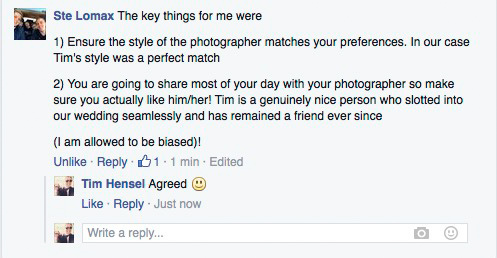 I cannot stress enough how fantastic the whole process of working with Tim on our Wedding Photos has been. From our first introductory meeting right through to the final album, Tim has been everything you could possibly want from a wedding photographer. The quality of his work is exceptional and the personable and friendly way he dealt with us throughout the process and more pertinently with all our guests on the actual wedding day was outstanding. If you are looking for a professional, friendly and innovative photographer that understands and appreciates your own personal requirements and delivers the best quality products on the market at a value for money price then Tim Hensel is this photographer. It really has been a pleasure, its so refreshing to find a good photographer who is great with people, especially children (even grumpy ones, lol). I will definately be recommending you to everyone I know and you will be our first choice next time we need a photographer, Thanks for everything. 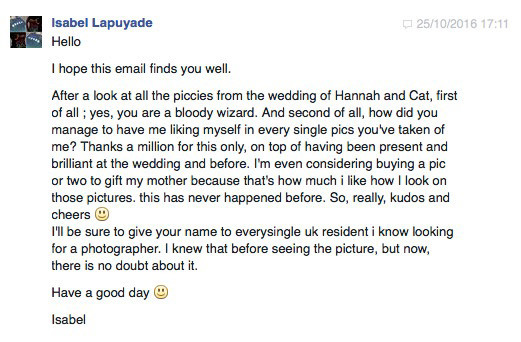 Tim was incredibly professional, helpful and attentive whilst photographing our wedding. He put us and all of the guests at ease whilst guiding and giving direction. He has a great sense of humour which all of our guests commented on and he was a massive hit. We really appreciate him coming all the way from Kent to honour our booking and it made the day extra special! Thanks Tim! Sam & Jake. 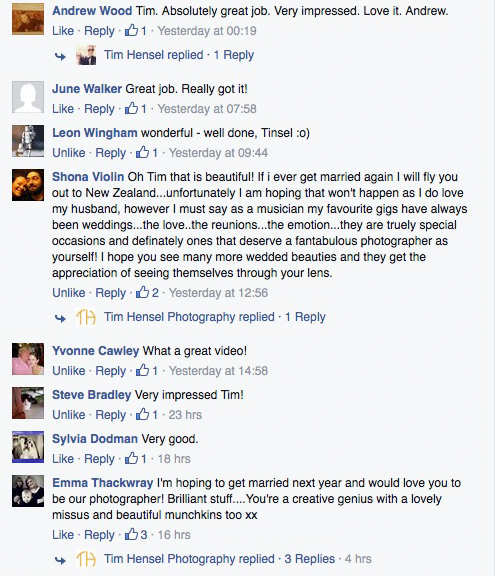 We loved having Tim there on our wedding day. 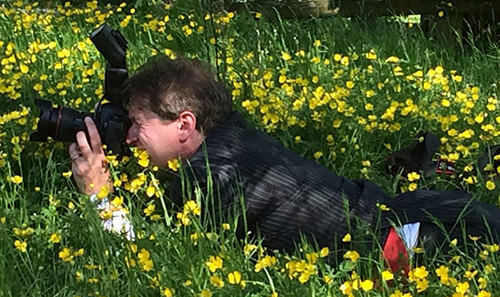 And the photos he produced were nothing short of perfect - he made everyone feel so relaxed. Couldn't recommend Tim more highly! 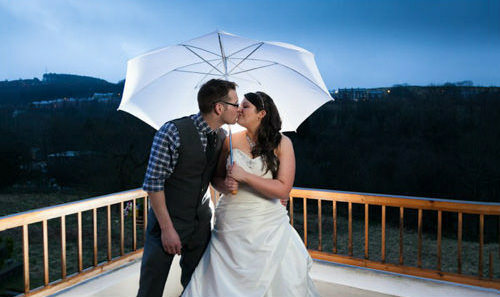 Tim Hensel photographed my wedding last year, and was simply brilliant. The photos are lovely, and everyone said on the day how nice and easy he made everything. Me, standing on a table smoking a cigar. Because sometimes, if the situation demands it, that’s how I roll. 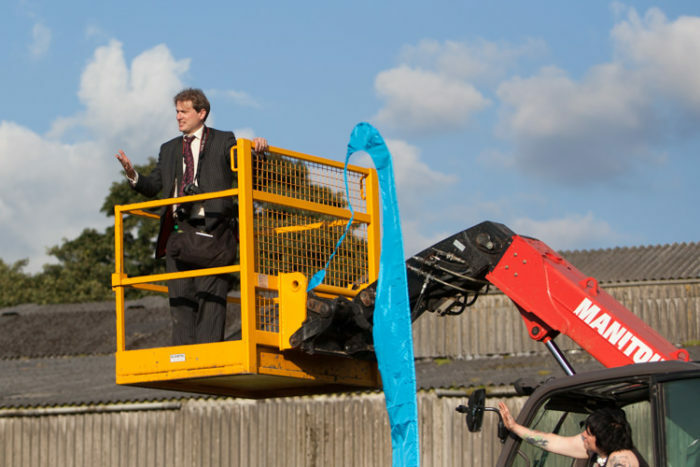 Me, directing the action from on high. I have a loud voice but am exceedingly polite. 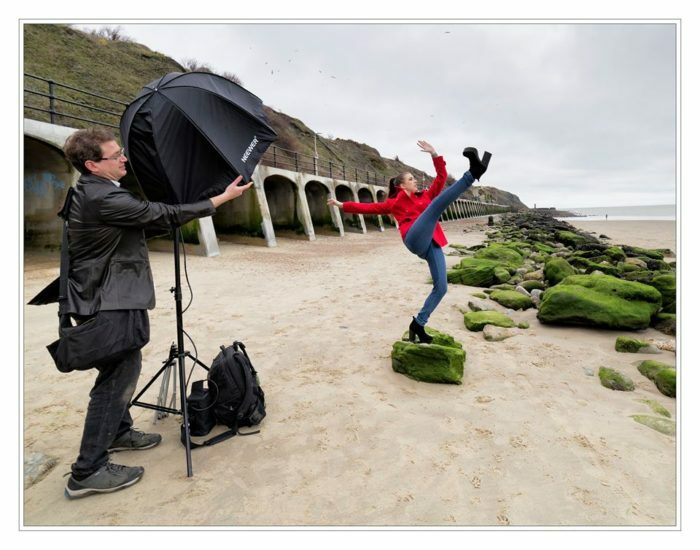 Me, on the beach in Folkestone, attempting to hold a softbox still in the wind while the model stands on one leg. 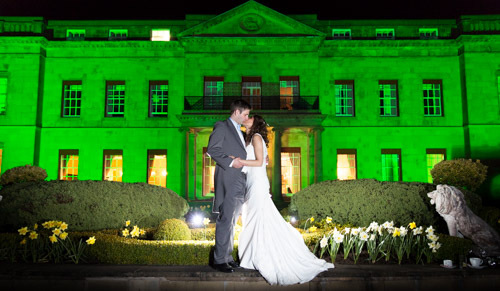 Tim captured our day perfectly, was very professional and a pleasure to work with. We were really happy with the photos and would highly recommend him for wedding photography. Tim has great artistic talent. His work is not run-of-the-mill professionalism. His images capture the joy, romance and excitement of one of the best days of our lives. 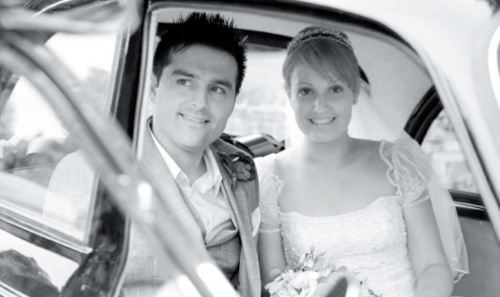 Tim has a genuine passion for his job - he goes beyond and above what a standard wedding photography agency might offer. He is also a pleasure to be around, making everyone feel at ease while he pulls out all the stops to get the shot he is looking for. 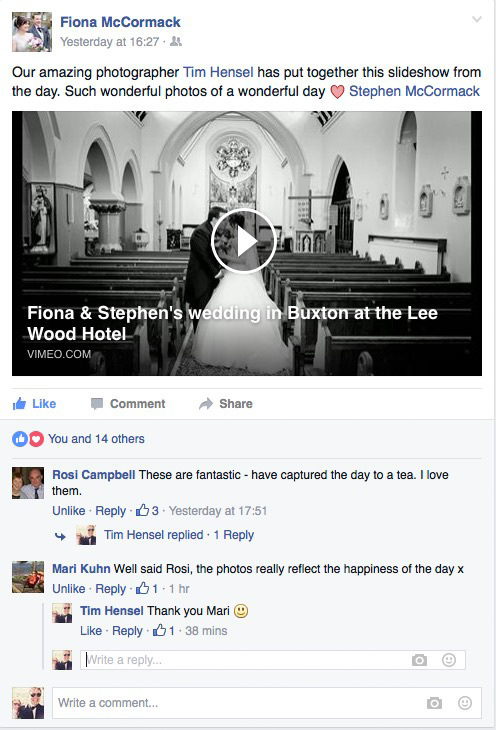 Tim was incredibly professional, helpful and attentive whilst photographing our wedding. He put us and all of the guests at ease whilst guiding and giving direction. He has a great sense of humour which all of our guests commented on and he was a massive hit. We really appreciate him coming all the way from Kent to honour our booking and it made the day extra special! The pictures are absolutely amazing, I couldn't have asked for better. Thanks Tim! Sam & Jake. Tim did the Photography at my Brother's Wedding and my Best Friend's Wedding. He is absolutely fantastic. The pictures are the best I have ever seen. He is absolutely incredible. Tim is charming, kind, generous and fitted in superbly with all the guests at both events. He really works with the space to get the best pictures possible. I will definitely be ordering some up myself. If I ever get married I know who will be doing the pictures at my Wedding. Thank you Tim for making both Weddings so special and memorable. I highly recommend Tim for your Wedding Pictures, you absolutely won't regret it! 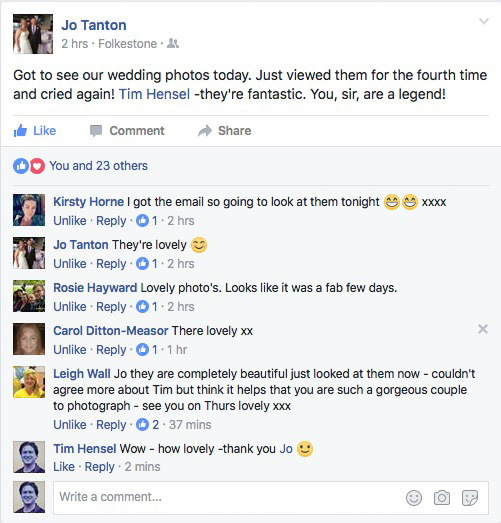 Our reception venue recommended Tim Hensel along with 3 other photographers for our big day we chose Tim because looking at his previous work he really tried to get the natural shots which is what we were after and I can confirm we weren't disappointed! Tim is so easy going but also very professional at his job he took into account everything (like even taking signs off trees) to make sure he got the perfect shot for us! Even through the wedding breakfast he sat there and edited 7 different photos for us so we would have some professinal ones straight away! 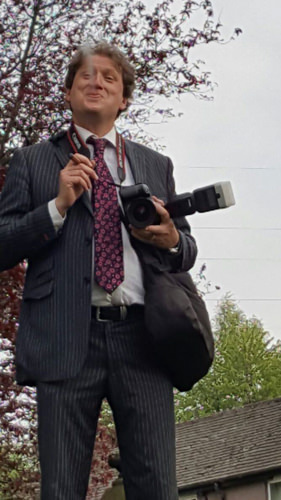 Everyone commented on what a great photographer he was considering the day was one of the hottest of the year and uncomfortable for everyone in suits and tight dresses he showed so much patience and worked tirelessly all day! Thank you Tim for being so easy to work with and I would hands down recommend you to anyone! Fab guy! Just viewed my photos again and they're just as breathtaking as the first time. Tim managed to tell the story of our wedding day with so many natural looking photos. Highly recommended! Tim helped us all feel really relaxed which resulted in some of the most beautiful pictures of me my sisters and niece. I would definitely use Tim again. Excellent, excellent, excellent... I loved being a model for Tim. Great guy, good laughs yet very professional and composed. Absolutely love the shots. Worth the 5 stars! Will have to book again for my own business. It was a pleasure working with Tim today. Very professional and efficient. Look forward to working with him again. Highly recommended. Tim is lovely understanding of young children, adults and dogs. He produced some beautiful natural photographs we were very pleased with. I started by wanting a photo of my Family in the end I chose four as I was so taken with them. Really excellent! Great photographer and got a lovely shot of Alfie our owl delivering wedding rings! !